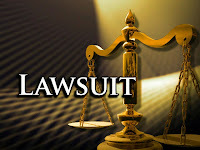 Robyns Simple Life: Lawsuit Update..! Well, we spoke to the lawyer last week.. We were told that our trial is on the court docket for the end of June. Then a few days later I got some disturbing news.. My lawyers assistant called and said the insurance guy for the other side who is representing them for the construction flaws wants too depose the 3 mortgage companies that turned us down for refinancing due too the construction flaws and he also wants to depose Lou again on June 4th.. That kinna rattled my cage a little bit but I was told not too worry about it it's pretty standard in cases like this.. So I guess we'll just have too wait and see what happens.. Will update when I know more..